Easter is one of those holidays I always enjoyed as a kid and as I got older I feel like I grew out of it. But now with kids of my own, it's a fun little holiday I like to celebrate with them, and like most holidays, I like to make it as green as possible. 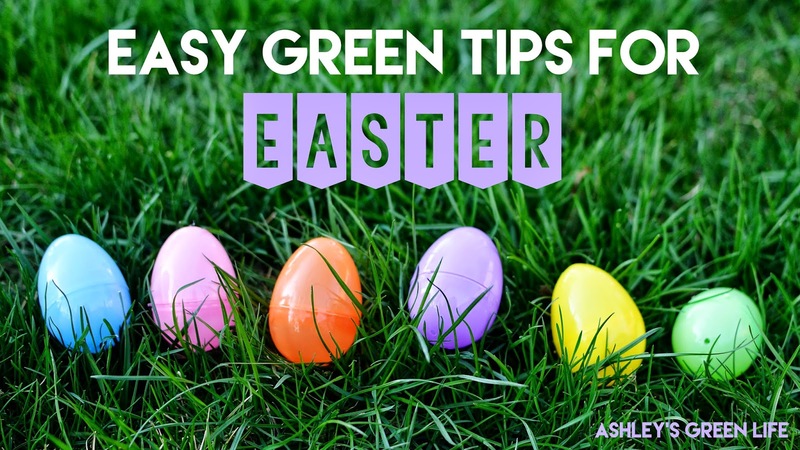 So today I'm going to share my top 3 ways to go green this Easter. 1. Go vegan with your Easter eggs! For years I haven't dyed Easter eggs because I'm vegan and don't want to use real eggs. My girls have been too young too care, until now, so it hasn't been a big issue. 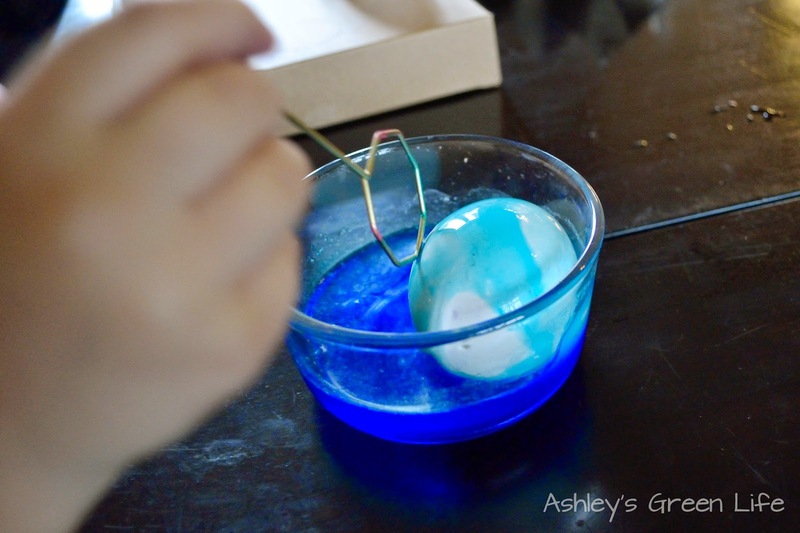 But since Avery is about to turn four, I thought it would be fun to find an animal-friendly alternative that we could use this year to dye eggs, and boy was I in luck! There are actually lots of options nowadays to use INSTEAD of real eggs. You can go cheap and use these plastic ones from Target for $3, or you could go fancy and get these porcelain ones from Eggnots.com for $20 for a dozen. For us, I chose the $3 option. As you can tell they look just like the real thing. Someone else was convinced and very excited to get to work! 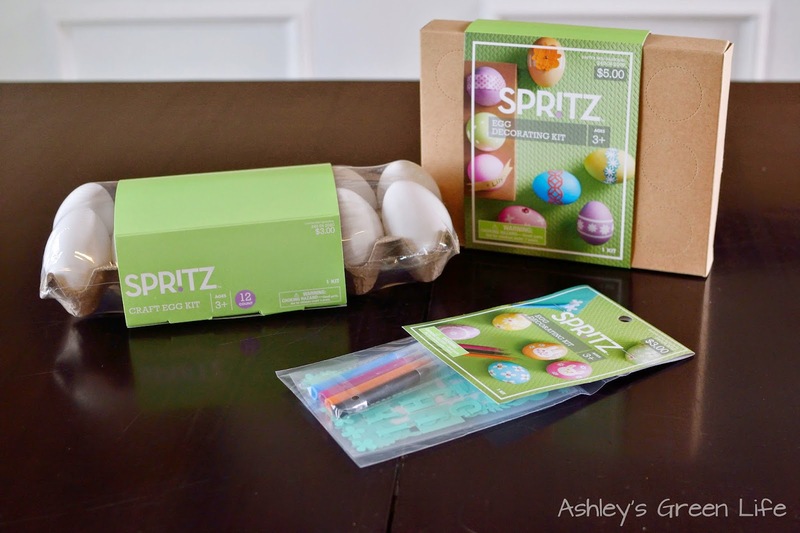 From Target, I also got this "Egg Decorating Kit" for $5 that came with stickers, markers, and the dye tablets. And I got an additional kit, which I probably could have done with out that had more stickers and markers, mainly because my girls are so young, they were fine with the decorations that came with the first decorating kit. If you look closely you can see the 6 dye tablets we used for coloring. 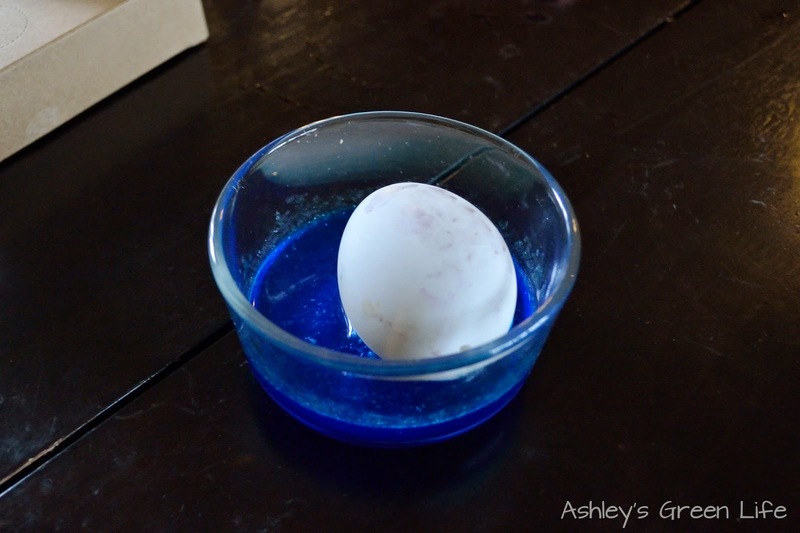 Here's the steps to make and use the dye for the "fake eggs," which you may notice is different from traditional eggs both in ingredients and in results. 1. 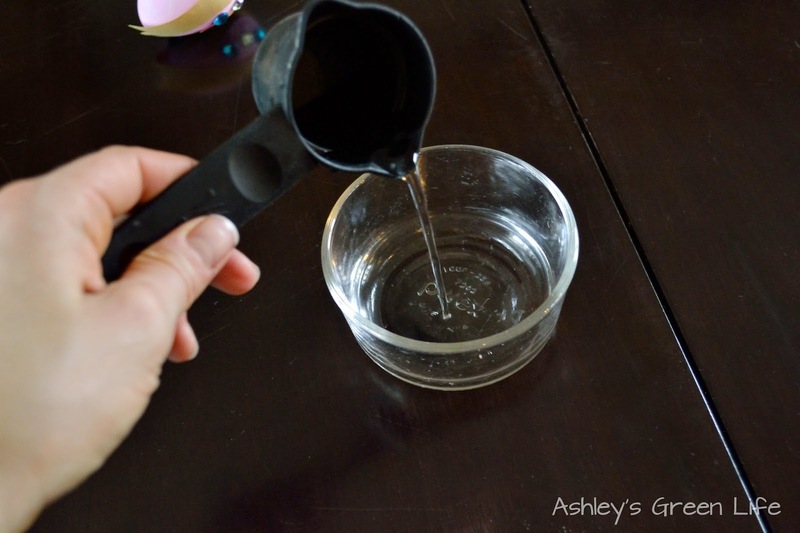 Pour 1/4 cup vinegar into a small bowl or cup. 2. 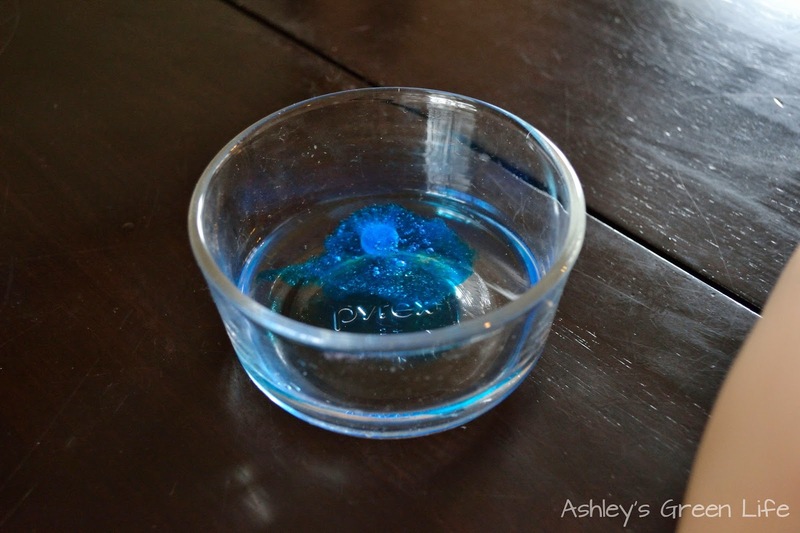 Add a dye tablet and allow it to dissolve (5 minutes). 3. Now add the egg. 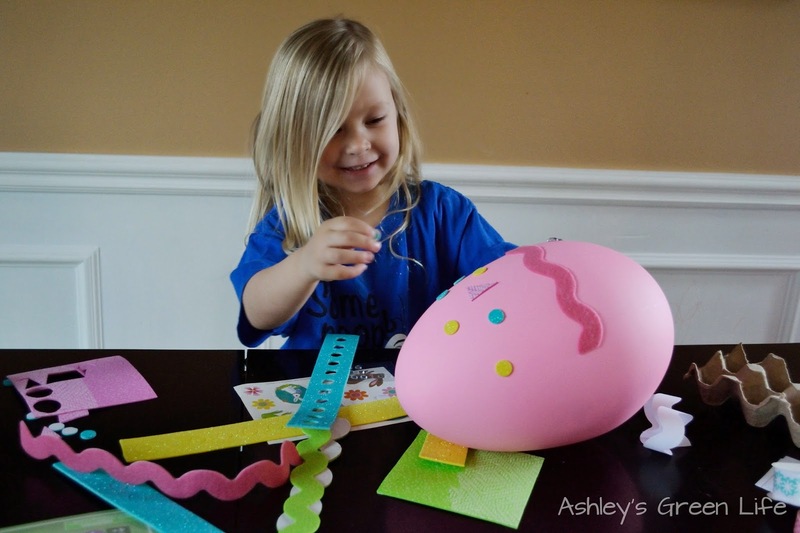 As you can tell, the eggs FLOAT! This makes it very hard to dye them since you constantly have to be pushing them down into the dye in order for them to pick up some of the color. On top of that the colors were not turning out very well at all. The blue you see here was the best and strongest color, but all the others looked as white as they did (or so it seemed to me) when I first put them in the dye! 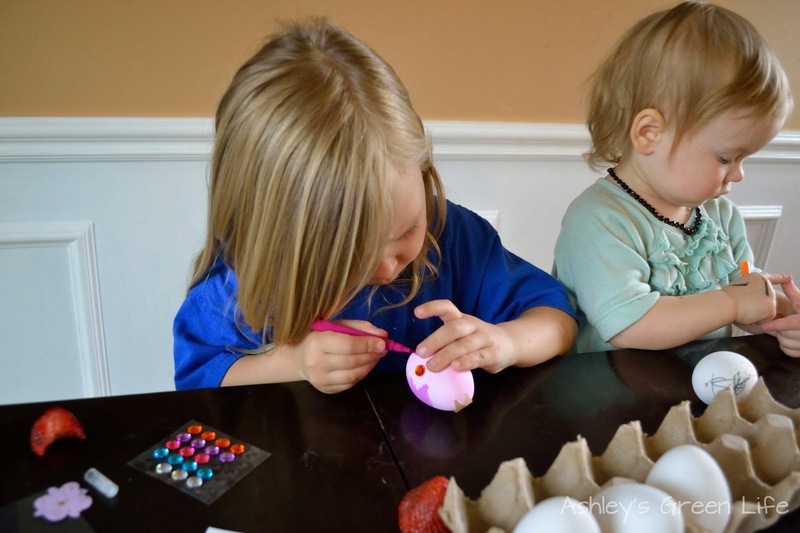 So instead of worrying about the dye, the girls jumped right in with decorating the eggs. 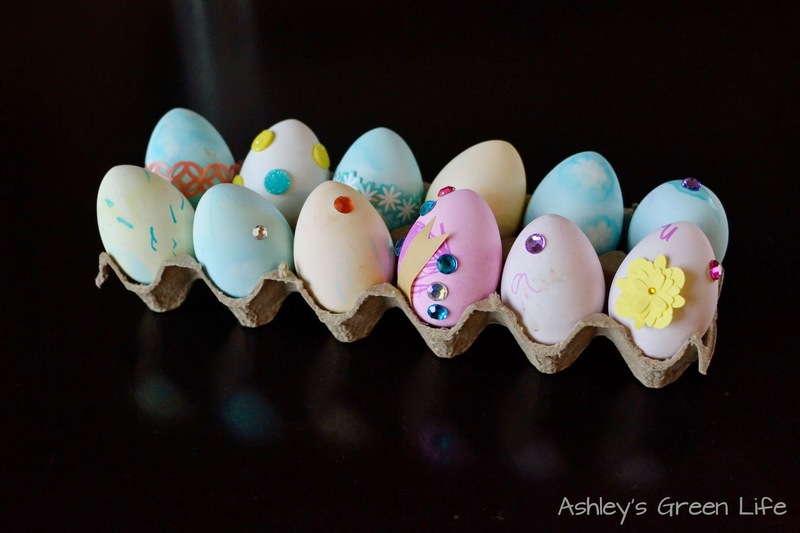 They used stickers, markers, and little jewels and flowers to decorate the eggs however they wanted. 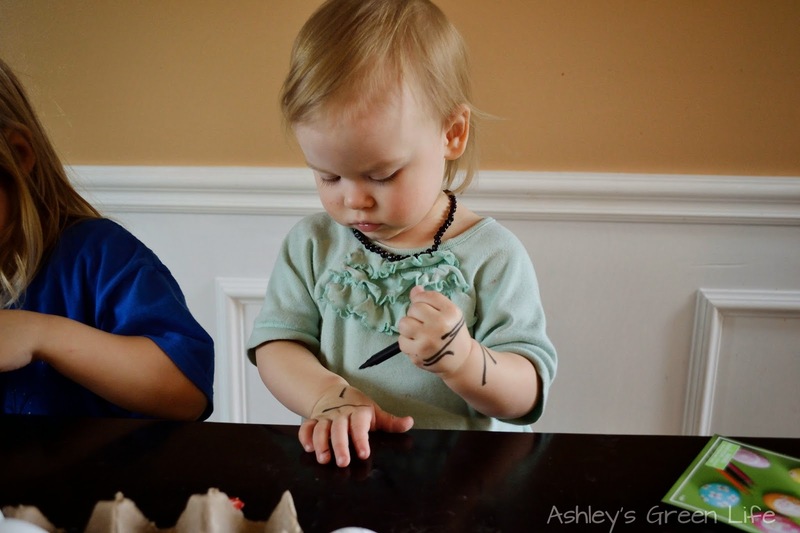 to decorate...herself (one of here favorite activities)! So here's the finished eggs, and although they look nothing like eggs I've dyed in my pre-vegan days, I love them and how unique they are. 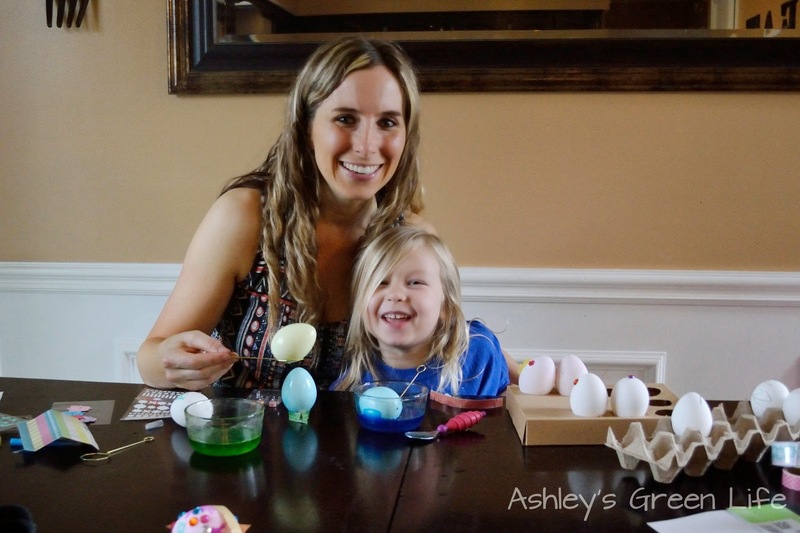 Not sure how interested Avery would be in decorating the small eggs, I knew this large egg I also got from Target ($3) would be a sure-fire hit...and it was. I got a separate sticker kit ($3) and she went to town decorating it. Be sure to see the finished egg sitting next to me in the video. 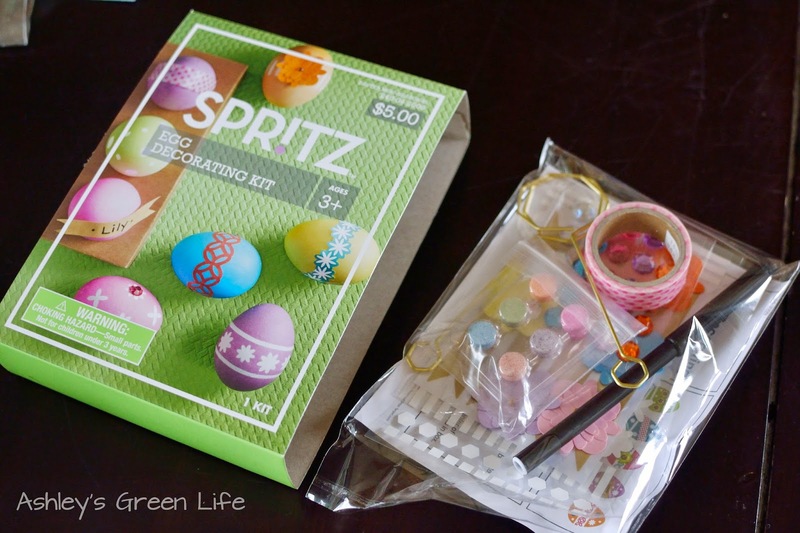 My second green Easter tip is just to reuse all your Easter supplies and materials year after year. I'll be the first to admit that traditional Easter supplies are not the greenest of materials. Plastic eggs, fake plastic grass, and more plastic Easter baskets all slightly make me cringe, so to counter this I reuse them. So instead of tossing them out or losing them (which happened a lot after our first Easter with Avery), I now have an organized system to keep and reuse all of our supplies so I don't have to go out and buy them every year. 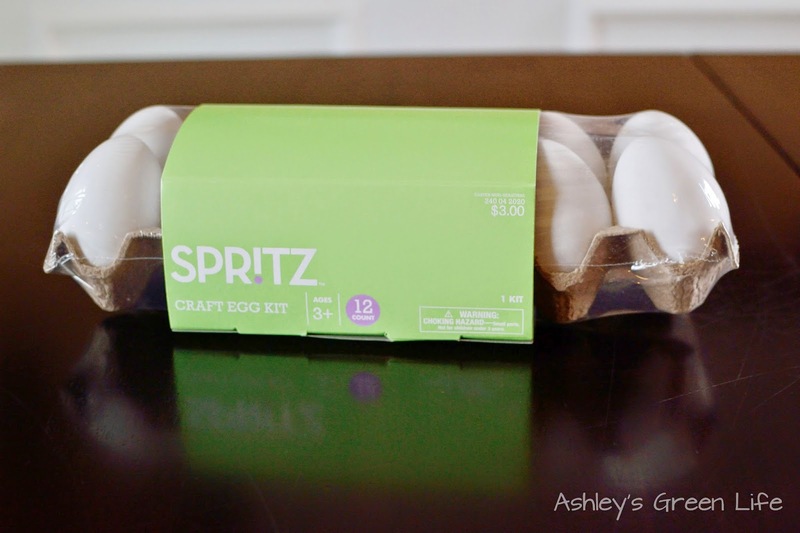 This helps me keep Easter supplies out of the landfill and save some money too. 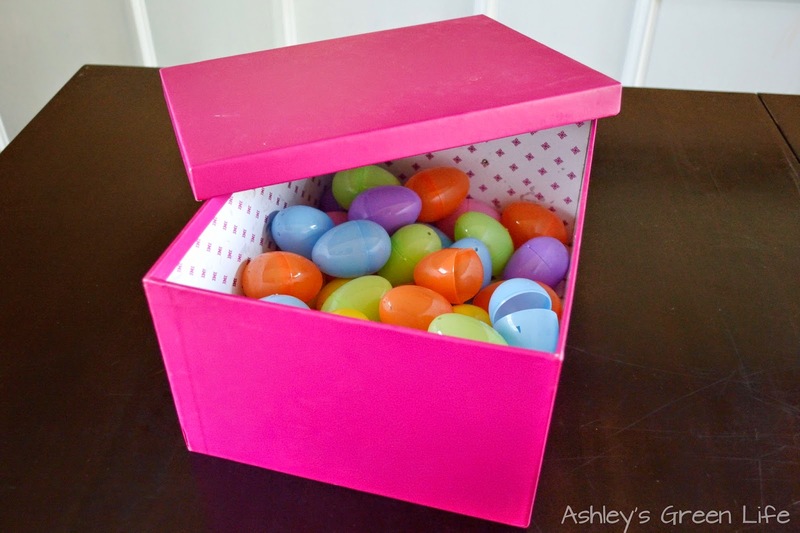 The first way I reuse my supplies is to have a designated box for plastic Easter eggs. 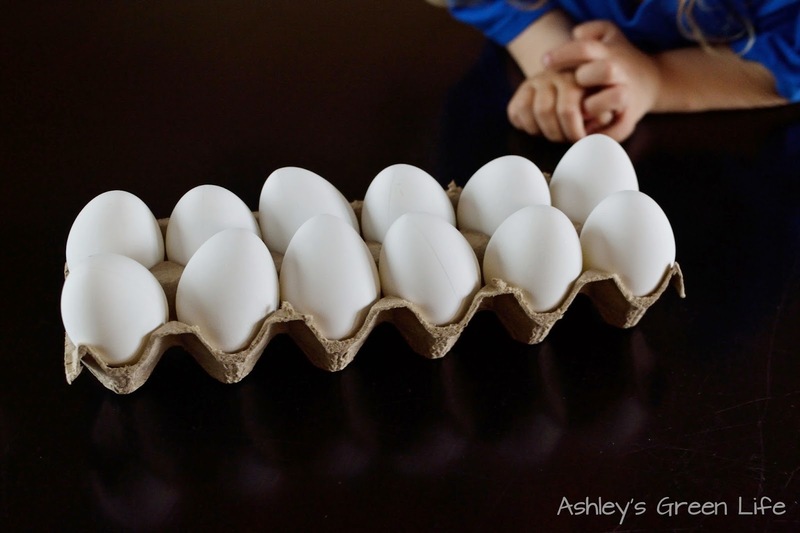 I just use a photo box and store the eggs in there. When I need them, I open the box and fill the eggs. When Easter is done, I put them right back in the box so they are ready for next year. 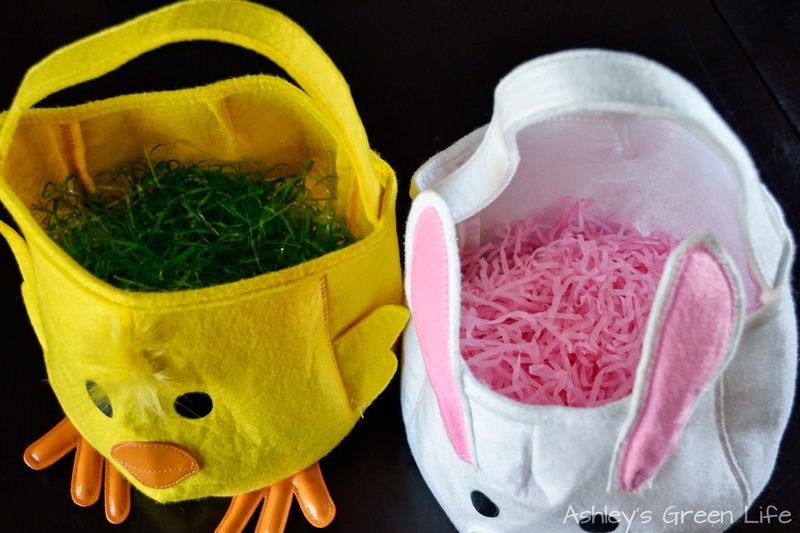 I also try to reuse the plastic Easter grass that looks oh so cute in the baskets and as decorations. To store this I keep it in two of our Easter baskets, one has the green grass, one has the pink. The last item I try to reuse are Easter baskets. 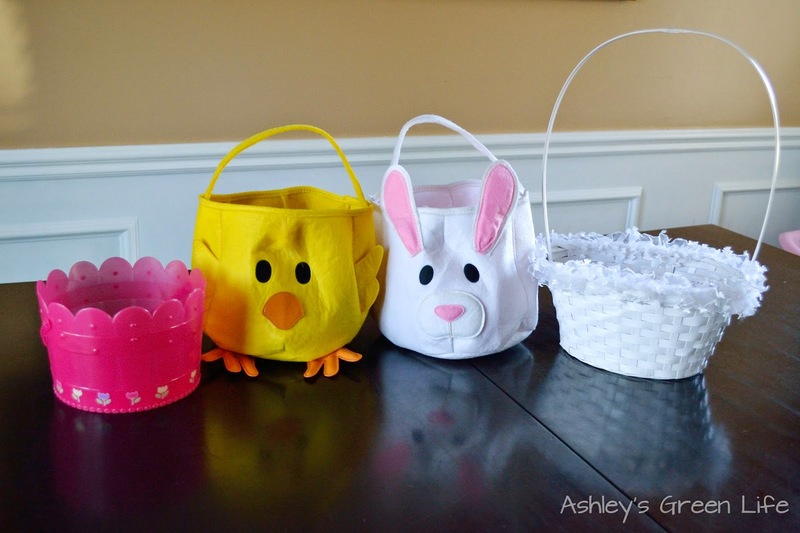 I know walking the aisles of Target can be tempting to splurge and get the latest or newest Easter baskets, but since my girls are still young and don't seem to mind the same old Easter baskets, I try to reuse these as well. 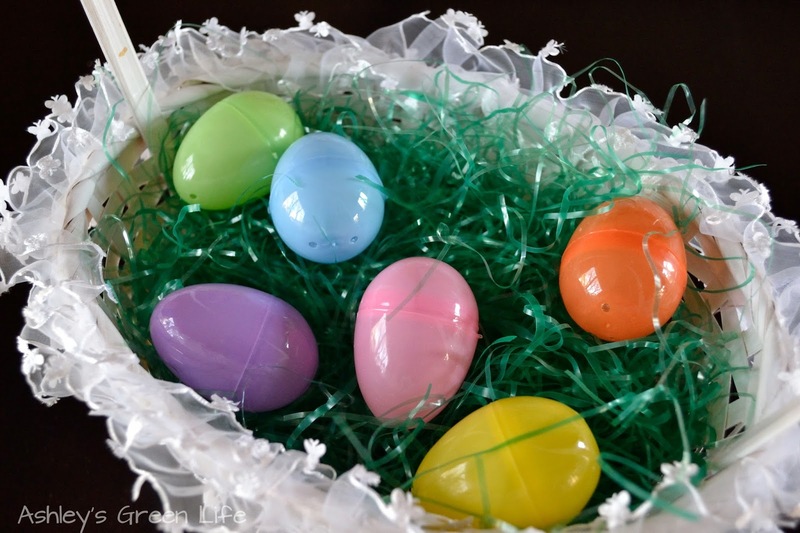 We have four that they can choose from when searching for eggs and I store these with my Easter decorations and supplies so they are ready to be reused year after year. Our Easter basket selection to be reused. 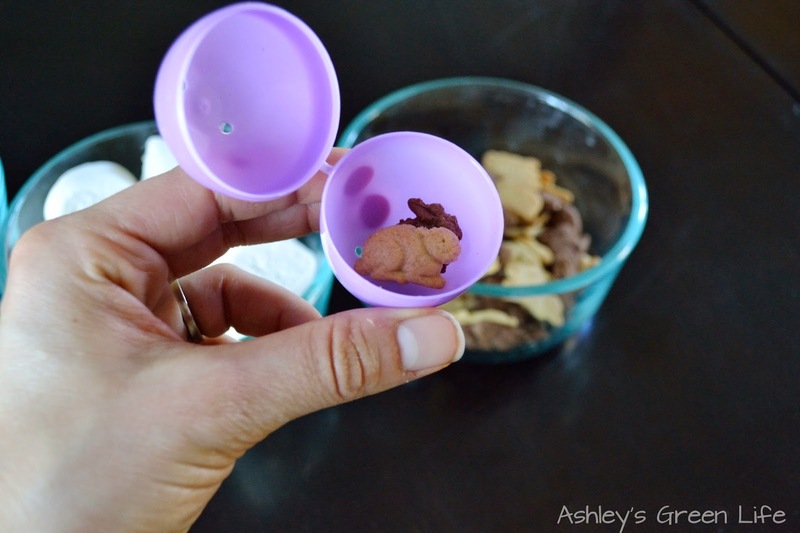 So that's how I try to go green and reuse our Easter supplies. 3. 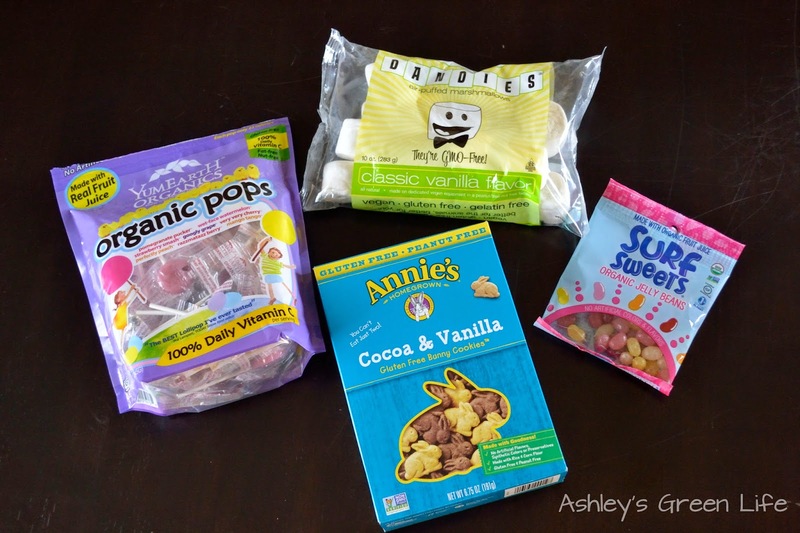 Use healthier candy or other alternatives. 2 jelly beans for one egg too. going to be excited about this one! 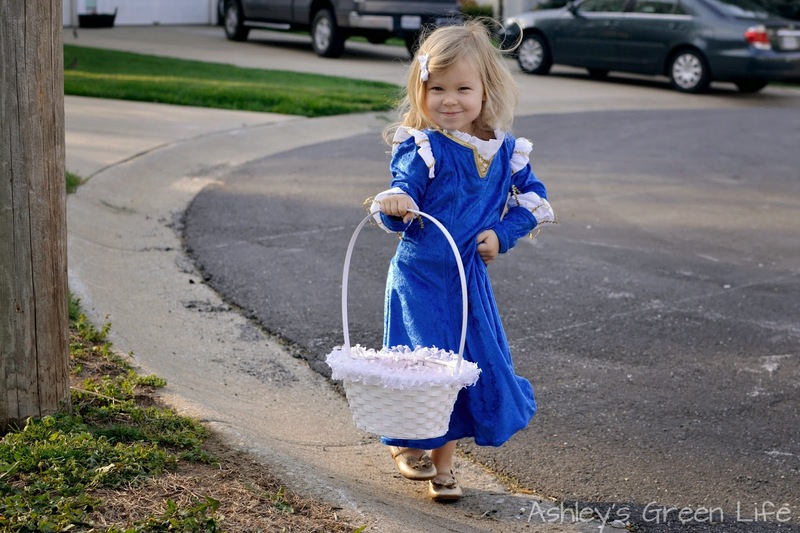 If you are attending a public Easter egg hunt, an idea you could try is to do a "trade" with your kids. 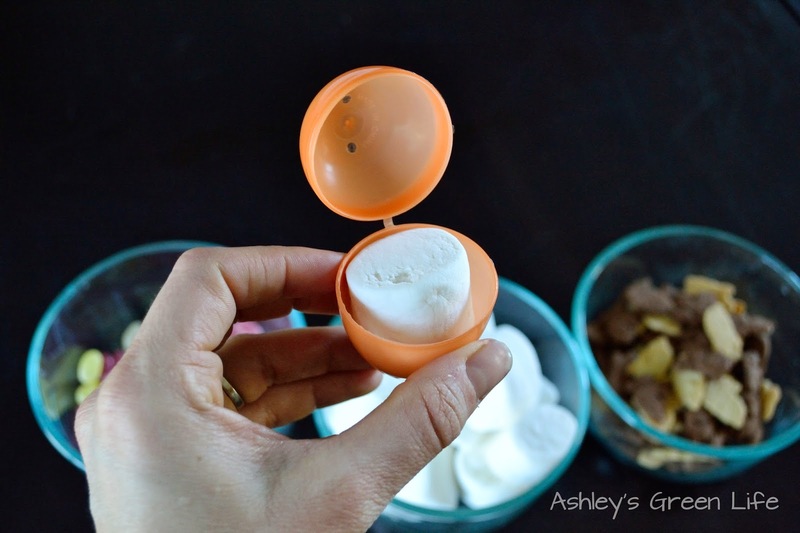 So since you can't control what is being put in the eggs at the hunt, you could fill your own eggs at home and trade them out egg for egg so they are left with the healthier alternatives. You could then donate the candy (to someone who doesn't mind the sugar, GMOs, and other ingredients), or look into sending them to soliders overseas...similar to a program called Operation Shoebox that donates Halloween/Easter candy to soldiers. 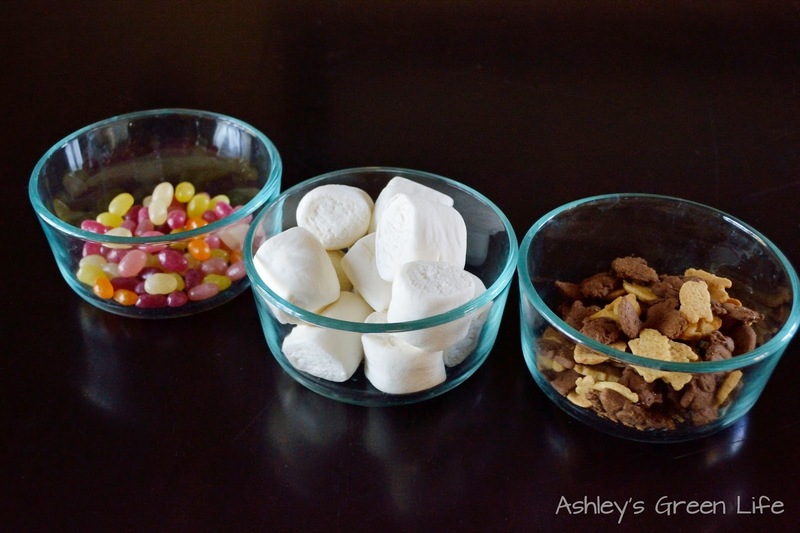 I know it's more work, but if your child has food allergies or you want them to have healthier opitions this may be your best option to have them still feel involved in the activity, while also making sure they have safer and healthier food choices. So there you have it, those are some of my favorite ways to go green at Easter. 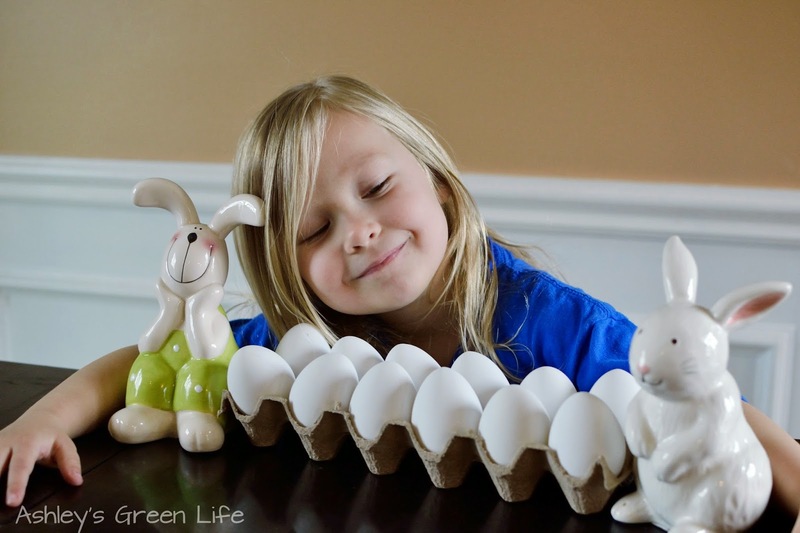 How do you go green at Easter? Share your tips below. Click here to see more of these pictures! personality really started coming out. 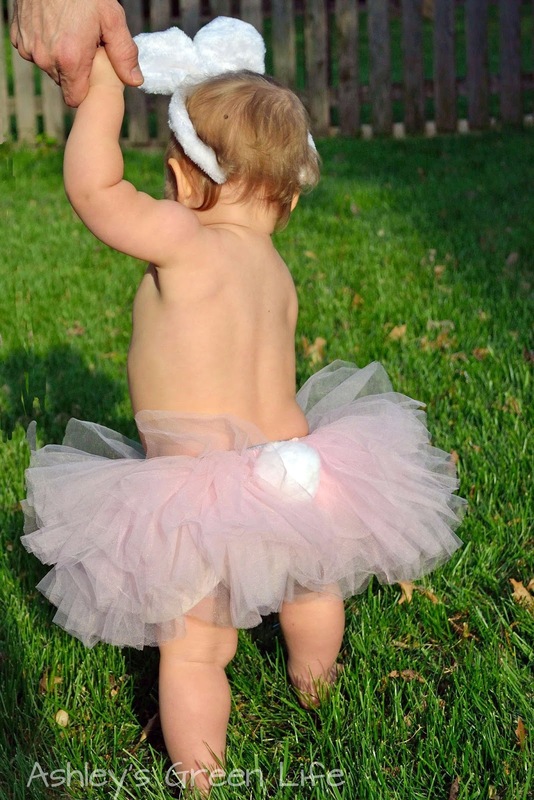 "Easter Dance" Avery did at this Easter. 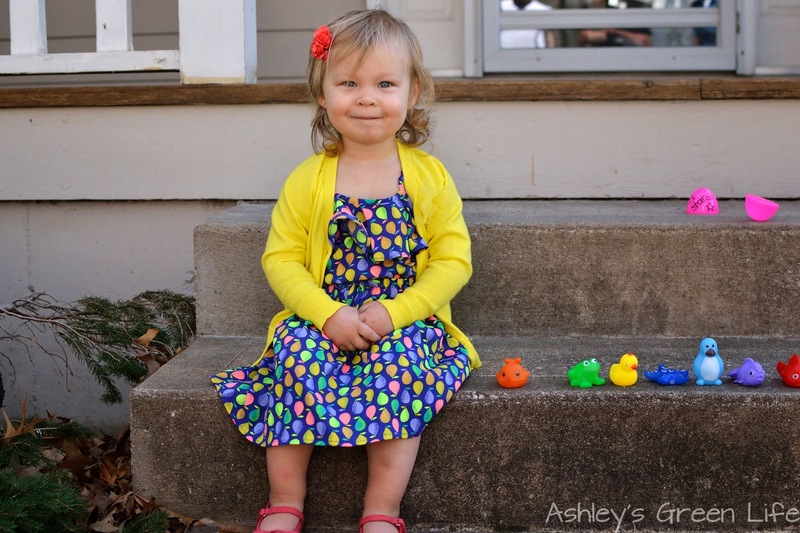 And here she is last year when she had just turned 3, rocking her "Merida"
dress from the Disney movie Brave. Love this sassy little smile! 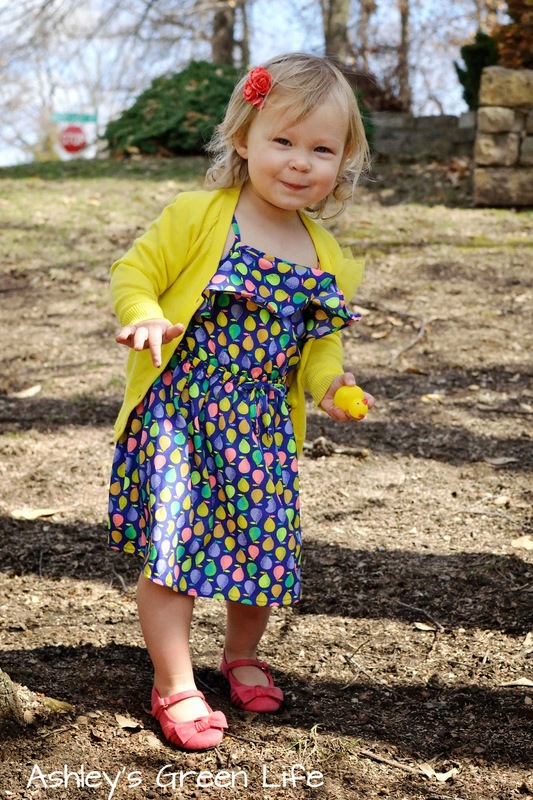 I can't wait to see what fun Easter memories are in store for us this year now that Mila will be right there with Avery looking for eggs (and sharing in the candy as well)! 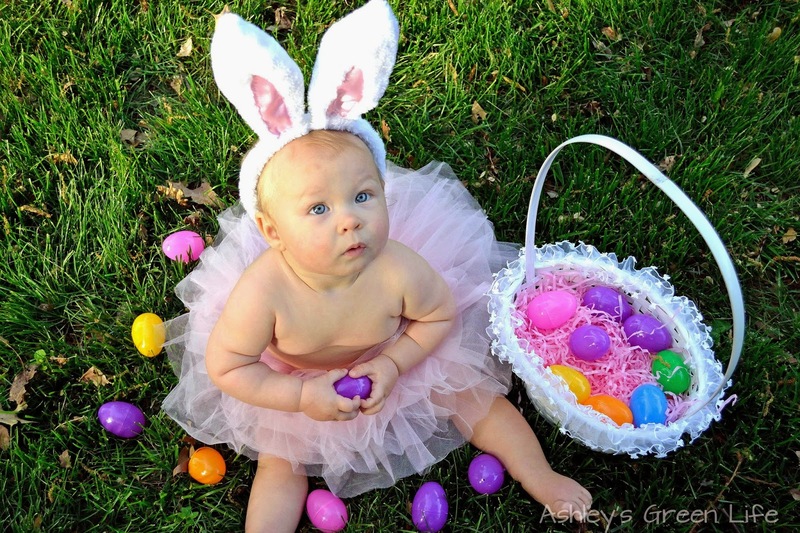 Happy Easter greenies.